This black and tan terrier is compact with a long pointed muzzle and erect ears. The Toy Manchester Terrier is a smaller version of the Manchester Terrier. The Toy Manchester Terrier originated in England. A Manchester Terrier - Toy ranges from 6 to 8 pounds (2.5 to 3.5 kg) and up to 5 kg. in the U.S. and Canada. The Manchester Terrier - Toy should be clearly defined black and tan in color. The Toy Manchester Terrier has a sleek easy-care coat which requires virtually no grooming. The Toy Manchester Terrier loves human companionship and attaches itself deeply to its family. Toy Manchester Terriers are highly intelligent and cunning and are easy to train. Excelling at obedience trials and agility, the Manchester Terrier - Toy should not be left unattended with small animals and should be introduced to children as a puppy. Toy Manchester Terriers can be snappish and headstrong and require firm training and early socialization. Some Toy Manchester Terriers are prone to glaucoma, Von Willebrand's disease and may sunburn easily. The Manchester Terrier - Toy can be expected to live about 15 years or more. The Manchester Terrier - Toy loves to chase things and should only be let off a leash when properly trained. Otherwise, this breed enjoys running alongside a bicycle. Active indoors, Toy Manchester Terriers are well suited for apartment life. 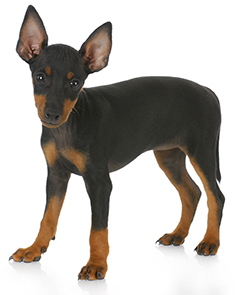 Find Manchester Terrier - Toy Puppies with our Free Breeder search!